Terrorism, climate change and the American president-elect are expected to dominate the agenda of this year's la Francophonie summit of mostly French-speaking nations, which gets underway today in Antananarivo, Madagascar. Member nations France, Belgium, Chad and Burundi are among those that have been victims of extremist attacks since the last gathering. "Questions of security, questions of responding to Daesh [ISIS] and its affiliates in Africa are going to be … fairly prominent in the discussions," said David Meren, a history professor at the University of Montreal. Canada has already committed to an African peacekeeping mission involving 600 troops and 150 police officers. The decision on exactly where they would go is expected to be made next month. The main contenders are Mali, the Central African Republic and Congo. 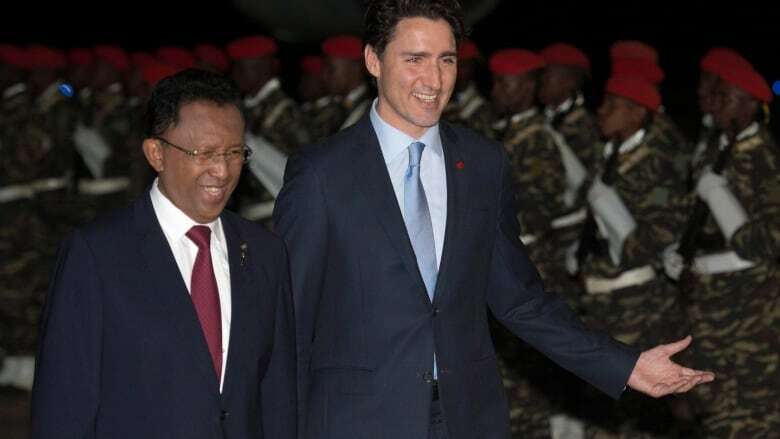 Prime Minister Justin Trudeau arrived in Antananarivo, Madagascar's capital city, shortly after 8 p.m. local time (noon Eastern) for the summit today after spending a day in Liberia, where he met with Liberian President Ellen Johnson Sirleaf and female leaders from across Africa. Trudeau will continue to deliver his message about the importance of empowering girls and women with a speech that is expected to also highlight his support for gay and transgender rights. Canada is also putting the final touches on a joint resolution with the nation of Benin to put an end to forced and child marriages, an issue that was also championed by the previous government. Climate change is also a grave concern to many members of la Francophonie, including the island host nation. The World Food Program has blamed climate change for exacerbating the risks of drought, cyclones and floods in Madagascar, where the United Nations is working to provide aid to a million Malagasy in the southern part of the country who are going hungry because of a three-year drought. La Francophonie's current secretary general is Canada's former governor general Michaëlle Jean. The 80 members of the organization are a diverse lot, ranging from former French colonies to observer nations with seemingly no connection to France, such as Estonia, Thailand and Costa Rica. "A lot of the newer countries see the Francophonieas a useful forum, a useful vehicle to be furthering their own international agendas, not least questions of economic development," Meren told CBC News. Economic growth is a big part of the reason that Ontario hopes to join Quebec and New Brunswick as members of la Francophonie. With 600,000 francophones, Ontario has the largest population of French speakers in Canada outside Quebec. "We want to show and welcome more francophone newcomers. They come with strong assets, usually being a bilingual community, and this is all part of our plan to grow the economy," said Marie-France Lalonde, Ontario's minister for francophone affairs. According to Lalonde, membership in la Francophonie brings opportunities for tourism, foreign students at Ontario universities and business. She said Trudeau has pledged his full support for Ontario's bid for observer status, unlike the previous Conservative government. "There was discussion before, unfortunately that door was closed and they didn't seem to be entertaining the idea that it would be a good decision for us, and they would not support us," Lalonde said. In the wake of the U.S. presidential election, where there is now uncertainty around international trade deals and security pacts, Meren said la Francophonie may present new opportunities for partnerships. "Strikes me that the Francophonieoffers Canada and the Trudeau government a vehicle to find potential allies and other countries with which to co-operate, to respond to the potential fallout from Trump."